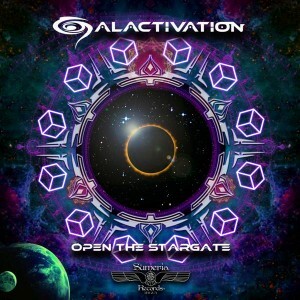 Sumeria Records is thrilled to present Galactivation’s debut release, Open The Stargate. This album is made with the intention to remind us that in the center of our galaxy, the sun, and ourselves, there is an infinite amount of energy condensed into a black hole. Deep inside, amidst complex geometry, we are looking for the origins of sound, frequency, vibration, and silence. Galactivation is a balance between groovy dark bass lines, intelligent sounds, and synaesthesiac melodies. Mastered by Samuel Soler at The Dark Face Studios, Barcelona. Graphic design by Sumeria Records, Ibiza. MP3 Download | FLAC Download | WAV Download · Download count: 8,309. Super high quality psytrance. Amazing release. Thanx Fede Thanx Sumeria Records Ibiza. Killer album man!!! Love it!! Ah comme c’est bon !!!!! simply sensational … this album is full of originality and creativity! The quality of the mix and master are at an excellent level and clashes with ALL projects full-on night !!! That last track was magnificent. Thanks! Raw and Epic, real nice release, the length of the first two tracks take you great journeys. “La Cueva Del Ermitaño” is superb beyond words. This is really good. What a wonderful sound – bouncy, happy, extremely dance-able and keeps you interested throughout. It works on many levels. Awesome! wooowww! killer grooves and ambients…want it on a big festival with many watts! OH my God!!! simply amazin!!!!!! !